Celebrate on Christmas morn, the day that love and hope were born. 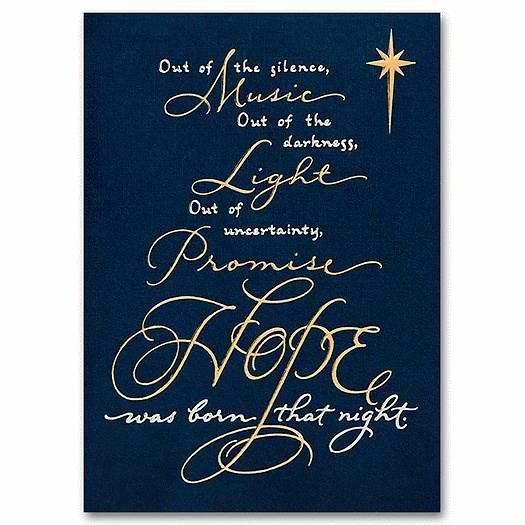 Hope…I believe hope is an appropriate place to start this Christmas journey. Both of these definitions talk about hope but hope in what? I know what I hope. I hope that my own disease stays in remission. With every blood test, MRI, and blood pressure reading…I hope. I hope that the inflammation in my arteries disappears, that it is totally and completely gone. I hope that I become the case that baffles the doctors and they can’t figure out what they had seen before and why it isn’t there anymore and then I hope that it never comes back. We all have hopes. I can’t help but think of Hannah’s parents (read Hannah’s miraculous story) and all of the hopes that they have for her. What do you hope for? Maybe the better question is what or who do you hope in? Mine is more than the whimsical, baseless optimism of the world because I have prayer and I have faith in that prayer and in the power of the God who hears those prayers. There is real comfort because my faith is not in the things of this world, but in God. The God who made the world, parted the sea, tumbled the walls of Jericho, shut the lions mouths, silenced the storm, made the blind to see, made the lame to walk, and emptied the tomb forever, is listening to my prayers, to your prayers, and He cares! I will say that again, because I know I need to hear it continually, I think we all do – God cares for us! Miracles are His specialty. Big prayers answered are an opportunity for us to glorify Him! Hope is a very strong feeling. Even in bad situations hope is there. The psalms are a wonderful illustration of this. They usually end with praise: God is good, God loves, God is faithful. But before we can get to the praise, we hear the hurt, we hear the doubt: Why have you abandoned me? Why are you not listening to me? So while there is hope, it is growing out of a place of pain. For yonder brinks, a new and glorious morn. O holy night, the night that hope was born. A baby who brings hope to the weary. A baby who brings a new dawn after the darkest night. I read the following description of the first Christmas by Annie Dieselberg, CEO and Founder of NightLight, and feel that many of us can probably relate, at least in part. It’s messy, and stressful, filled with disappointment and discomfort. But where does hope appear? Right in the middle of it! God with us, in the flesh. In the mess, in the pain, in the hurt, in the uncertainty, God with us! Hope showed up! I realized long ago that few Christmases are actually idyllic. In fact the first Christmas was anything but picture perfect. Mary and Joseph did not stop at a midnight mass to ponder the coming of their Savior. The political climate was chaotic and oppressive. People were forced to return to their city of birth for the census and the dirt roads would have been crowded, dusty, and noisy. Personal transportation was a donkey not a car with air conditioning and there were no noise-reduction headphones. There was no fast food and no convenient rest areas with picnic tables and clean bathrooms. On top of all this, Mary was experiencing the discomfort of riding on a donkey with a huge belly while experiencing labor pains. Arriving in Bethlehem was only a temporary relief to the weary travelers, as the inns were full. Since in those days people didn’t hide out in their hotel rooms watching TV and ordering pizza to eat in seclusion, they would have been gathering around fires to cook their food in community. Children would have been running around and parents would have been yelling after the children to behave. In the midst of this chaos, Joseph was under pressure to find a place immediately for his wife to give birth. Joseph is usually portrayed as calm through it all, but from my own experience and stories of others, few men are actually that calm when their wife is about to deliver their first child. Sure they were given a stable but that’s kind of like finally getting a hotel room only to find the bed uncomfortable, the carpet stained, mold on the walls, and the odor of the previous tenant still lingering – not even a 2 star hotel. Somehow we have spiritualized everything to look so idyllic. I can’t think of anything idyllic about going through labor in a stable surrounded by animals. Mary and Joseph’s moment for reflection and wonder probably only came after an intensive labor and after a visit by the Shepherds. There was little in this first Christmas that was quiet, beautiful, or private by worldly standards. Jesus came in the midst of chaos and he came into community accessible to all. He didn’t come to bring us a picture perfect Christmas. He came in the flesh, bringing hope to a chaotic world desperately in need. He came to a world in political upheaval because hope of peace is needed in these moments. He came to broken communities because He is the hope for better relationships. He came in the dark night because He is the hope that light will shine and overcome the darkness. He came to our stressed and burdened lives because he is Christ in us the hope of glory. Because of this I have more than just hope, I have assurance. I know that God is sovereign and in control and that no matter what my tests show this month or three months from now God has already forseen it, and He will never leave me. I know that God has been by my side through the trials of yesterday and he will continue to uphold all of us though the trials of tomorrow and if there can’t be true comfort found in that I don’t know where else we can possibly find it. The things of this world will crumble and fade away but we have an awesome, eternal, all powerful God who is just waiting on us to say – “Help. I can’t do this on my own anymore.” It’s the reason he came to us in the humblest of ways. If there is anything that I have learned it is this, no matter what happens today, or in the future, we have a loving God who hurts when we hurt, cries when we cry, and celebrates with us in the victories, both large and small. I know that God will provide us, all of us, with everything that we need for today and beyond that we don’t need to worry because He is holding this all together, and that is where we find hope. I again make a heartfelt plea on behalf of Hannah. Please join me in lifting her up in prayer and in sustaining her family with hope this Christmas. This is so true … hope in the midst of it all. And if Jesus could come in (and embody) hope in the midst of it all, then there really is HOPE for all of us. Can I re-blog please? This spoke to my heart and will need to re-visit and re-read. Please do share it. It is such an important message, not just for Christmas but for everyday after as well.